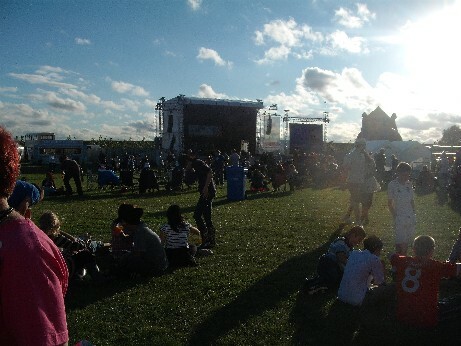 Glamping Part 2 – The Festival Edition! 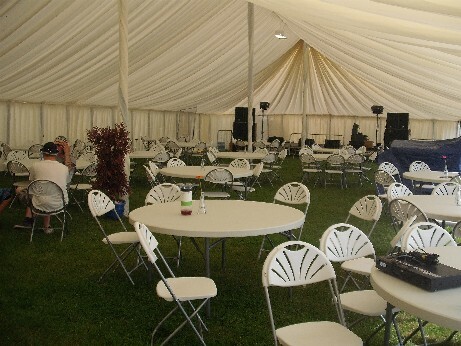 Well we have just got back from a very fab and very hot weekend at Tribfest – well hot until the middle of last night when it decided to pour down so we had a wet pack up to acclimatise ourselves for the return home, where it is also wet so the tent is in hanging up to dry in the garage! 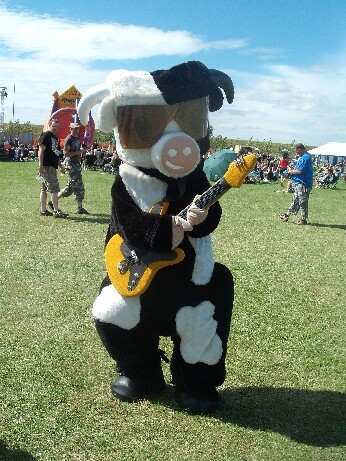 It was a great event where we saw tributes to lots of bands including Madness, Bon Jovi, Green Day and Lady Ga Ga. We really enjoyed it and are buying tickets for next year asap. 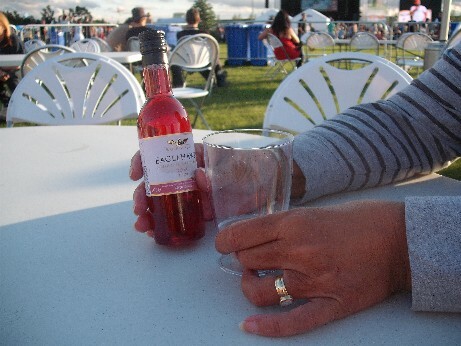 We bought VIP tickets on the advice of my sister who went last year as you get lots of extras for not much more money such as camping near the arena – so you can mellow out back at the tent (or knit in my case!) 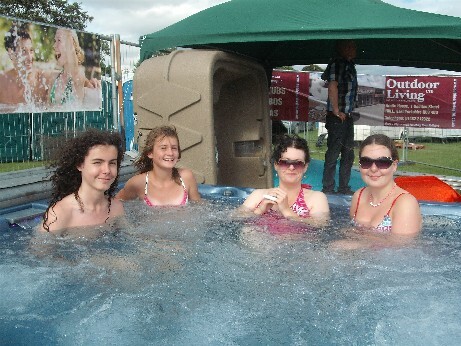 and still listen to the bands, a VIP tent with bar, indoor and outdoor seating and extra bands and best of all jacuzzis! The kids had a great time – my niece Sarah and my sister Jacky dressed up for the occasion – this is Sarah on Friday night. 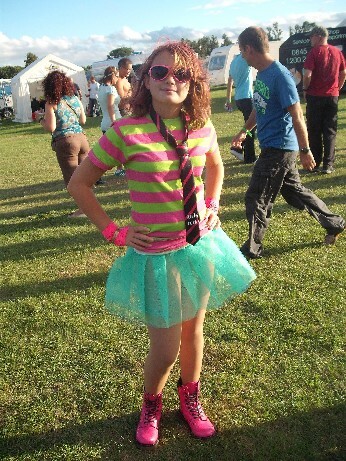 There were lots of people in fancy dress - tutus were very in this year! 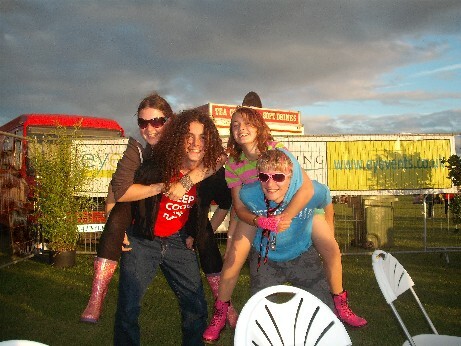 Ellie had her festival wellies on (as did most of the girls – I must get some pretty ones for next year -mine are a boring blue). I bet he was a bit warm! Look flowers on the tables! 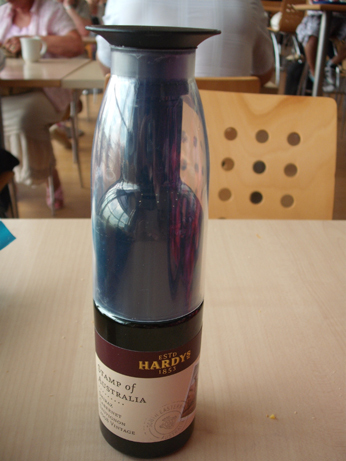 This is one Chris bought at a previous festival - it came full with a peel off lid - how convenient! My finger is mending well – thanks for the good wishes – and I was able to finish off knitting the wristwarmers, finally made a second matching one that I happy with – here they are in the field outside the tent where I finished them yesterday – while having a little mellow and a glass of red! Not identical but good enough! I have just got to stitch them up the side now – I knitted these at Xmas for Jake and they are a very quick knit and look very effective. 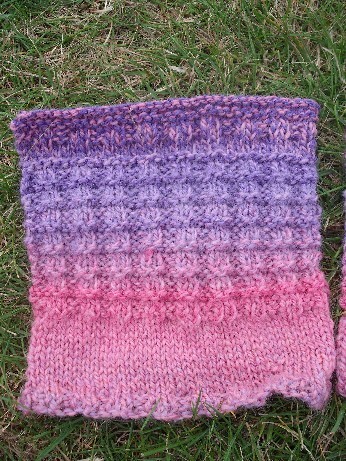 The waffle stitch pattern is a simple four row repeat which uses knit two, purl two for two rows and then two rows of plain knit. 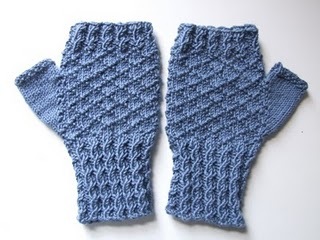 I would love to have a go at these – pattern details are on Barbara’s blog – it is from Ravelry but uses double-pointed needles which I have not tried yet. 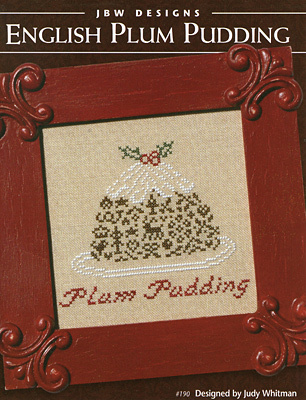 Barbara is a much cleverer knitter than me and does all sorts of gorgeous patterns using fine needles. 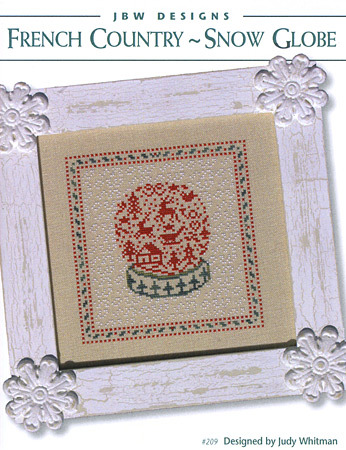 My new Xmas cross -stitch patterns from JBW have arrived today so I have got lots to amuse myself with – next weekend is the last camping of the season where we shall be back at Bolsover for our final show of the year, then it will be candles lit and on the sofa for another winter season! 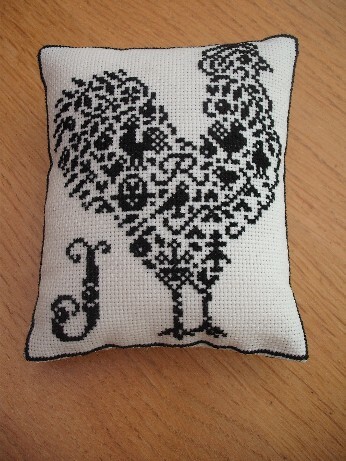 Thankfully I finished my friend’s present a couple of days ago as yesterday I managed to trap my little finger on my left hand in a car door and it still very painful so I am a bit one-handed now! It is not broken but I think I may lose the fingernail, it is wrapped up at the mo but will have a look again later (yuk!). So no sewing for me for a couple of days! 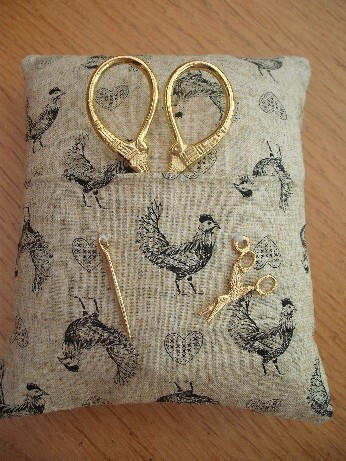 I decided in the end to do a pincushion finish rather than a pinkeep as the finished design is quite big but I did still do the little scissor pocket at the back. 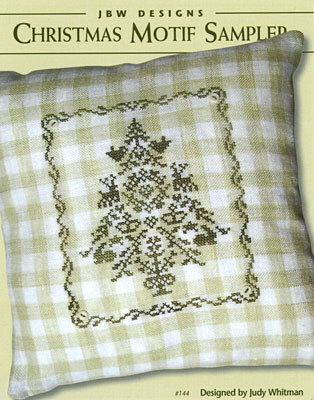 The fabric is a piece I got from a fabric sale locally when a company called Doughty’s who come to my town every year. 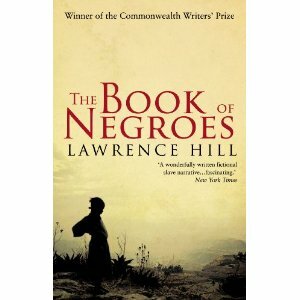 They also have an online store at that link. 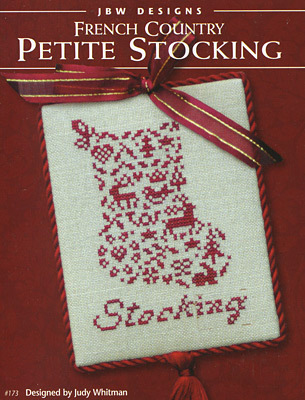 Speaking of stitchy goodness I am just off to Sew and Sew now to order my Xmas JBW Designs. 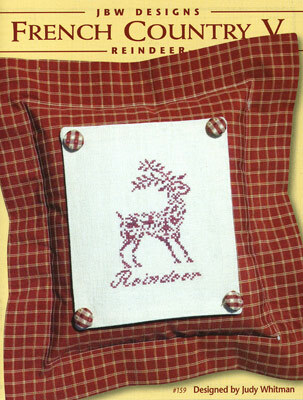 I have decided on the reindeer, the Xmas Pud and one of the tree sets – see previous post for pics of these. 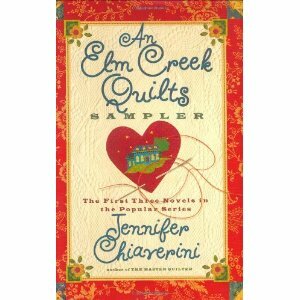 Also need to visit Amazon again for more Elm Creek Novels – they arrived on Friday and I have already read the first four! Is that we have come to rely on it so much. I have just acquired a new (to me) laptop courtesy of Ellie who has got a new one so donated poor old Mum her old one. Fantastic thought I , as I have been making do with a very, very old and slow cast off from work since my last PC failure a few months ago. Finally I can type and the letters will appear on the screen as I am doing it (rather than 5 seconds later) which will make blog posts so much quicker. Also I can install my fave game The Sims and build and furnish lots of nice houses which will make light relief of all the marking I still have to. So it has been great ever since last Tuesday and I have been playing and surfing and doing all manner of things technical …. until yesterday. Jake and I did notice a certain flakiness about the wireless connection but just unplugged the modem a couple of times and all was well. 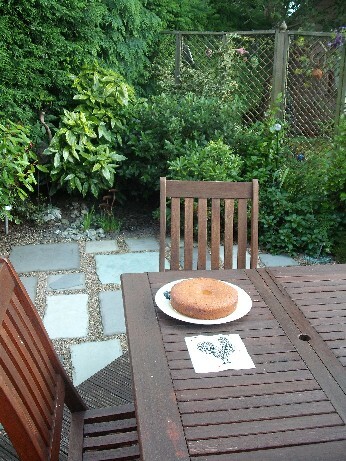 Today all is getting a little less well as it keeps disconnecting randomly – rang IT help and all is fine with hardware – he suggests that we are getting interference from a neighbour’s connection which makes sense as another network shows up on my list – think it belongs to next door. He advised trying to change channel to avoid them which I have done 3 times so far – fingers crossed for this one. Trouble is you can only change by going to a website so you have to be connected to do it! Ho hum. However what I was going to share with you this post was something completely different which is actually quite appropriate for the topic of technology and other little things life throws at us. I was looking at the lovely Mary Kathryn’s website the other day and she had a link to a site which lets you make your own version of the Keep Calm and Carry On posters from World War 2. I love these – we have them up at work as it is a very appropriate sentiment for anyone involved in education and I use the logo with my students. 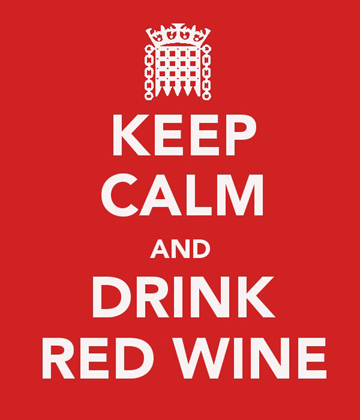 This site allows you to make your own so here are a couple of mine – the first one is so appropriate for my internet woes – though is a little early in the day for imbibing. I think I might get a t-shirt printed with this on! 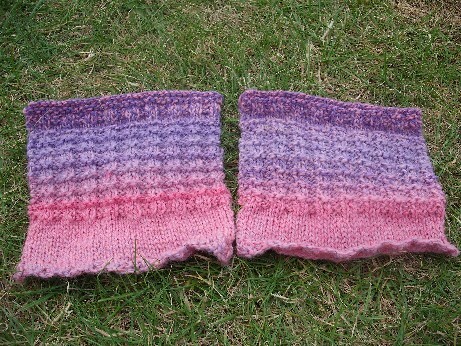 Have also been having a few problems with my latest knitting WIP due to vagaries of variegated yarn on a short repeat – have done one wristwarmer and have tried to make a second matching one, so far am on third attempt with different parts of different balls. 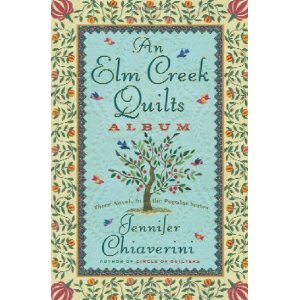 So this is a good poster for the knitting at the moment. A very worthy sentiment - I'm sure you will agree! If you want to make your own version the web site is called Keep Calm O Matic. 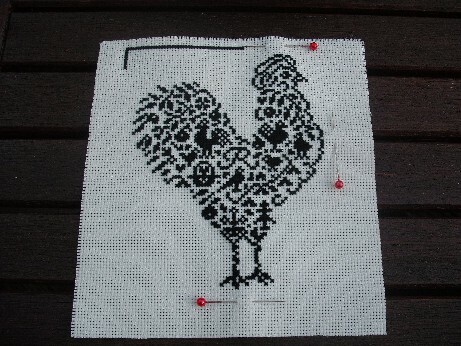 I am currently just at the end of my latest stitching WIP – which was started ages ago but needs to be finished asap as it is a birthday gift for a stitching friend and I only just realised that it is her birthday next week! Hopefully it will be finished tonight as I have a lovely evening in front of the TV planned (Syfy channel has been showing lots of disaster movies and remakes recently which has been good for stitching as you don’t have to concentrate!) 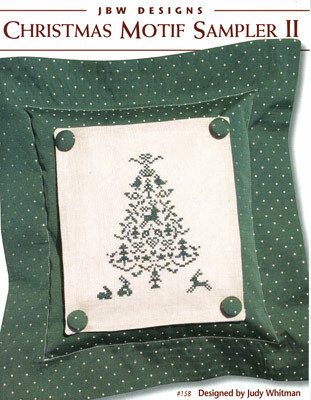 I am planning a different finish inspired by something I saw on a stitching website – a pin keep with a scissor pocket on the back so will post pics of that later in the week – assuming the internet is still ok! Keeping fingers crossed. 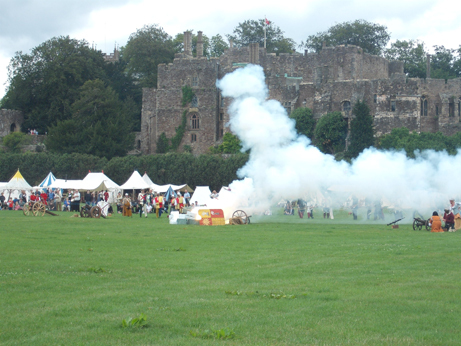 Just thought I would share some pics with you of the last re-enactment event we did at the gorgeous Berkeley Castle in South Glos. 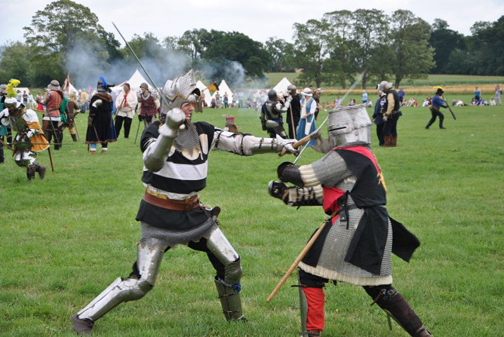 The weather was brilliant and we had a fab weekend as always – thanks to Plantagenet Events and all the people who made it possible. 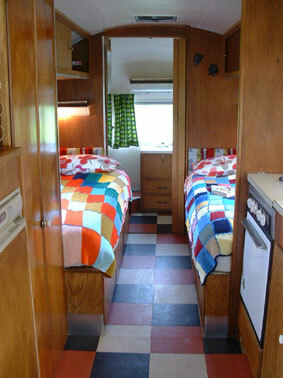 They sound very clanky - pity we don't have surround sound on this blog! The battle had a new script with some pyrotechnics to start with where a load of carts in the middle of the battlefield were set on fire by burning arrows which gave a lovely (if smoky) start to the battle. With that, the cannons and the hand gunners there was lots to go boom! None of the fighters from our group could make the event this time so Ellie and I were looking after our friend Andy from the Knights and Freemen group and any other thirsty boys we could see. 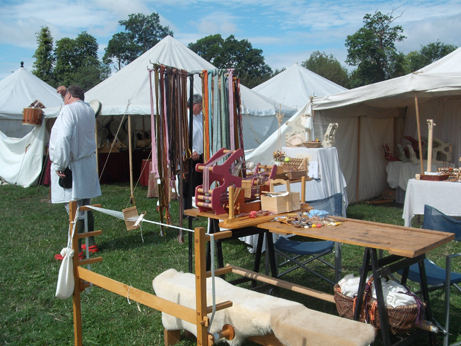 On Sunday morning I had a little wander round to take pics – I love looking at tents of any kind, modern or medieval but the ones at the big events are just so lovely – the amount of time and effort people put into their kit and equipment is amazing. 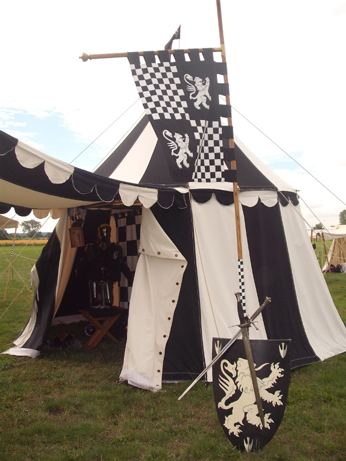 Below is a pic of one of my faves from the event – I don’t know the owner’s name to give him credit but what a wonderful tent – you can just see his armour on a stand inside the tent. 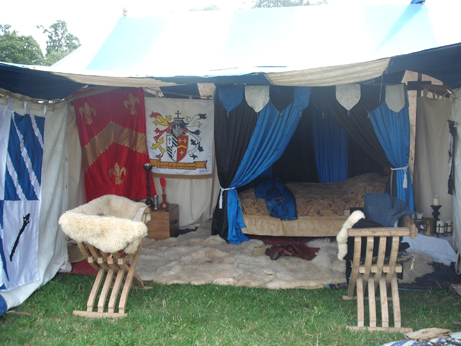 Here is my friend Jamie’s tent – it takes about 3 hours to set this all up – no quick pitch festival tents here! Here is Jamie in the tent and outside with friends Kat and Richard. 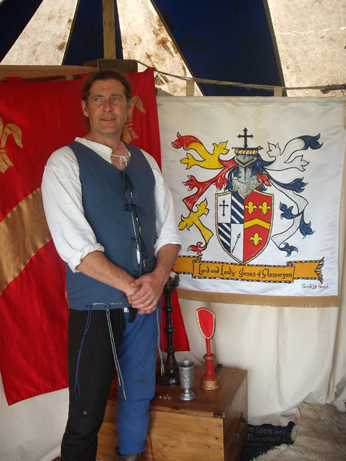 Kat is the amazing costume maker who makes fantastic Medieval and Tudor clothes and headdresses – please visit her website Kats Hats. Also had a quick look around the market – one of my favourite stalls was there belonging to Excalibur Artifacts – they sell all types of hand weaving equipment and had the most amazing selection of hand-woven braids. I bought a loom a couple of years ago – just need to find more time in my life so that I can practise! Hope you have enjoyed the little tour round the event – thanks for visiting and see you soon. Well here I am back from a lovely 10 days in various fields – the weather was very kind to us (extremely hot at Berkeley thankfully so lots of visitors). I have read a couple of articles in the newspapers recently about the art of glamping – glamorous camping – and as this is something we strive to do all the time thought I would share my tips with you. 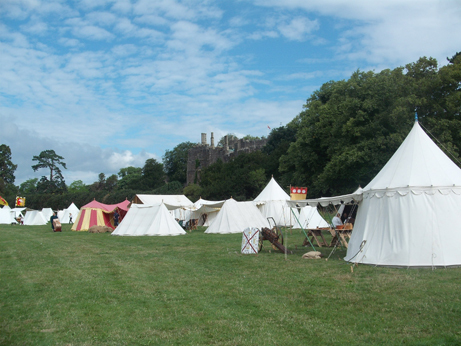 Location of course is very important and we get to camp at all the best historic sites at the UK which makes for some fab picture opportunities – here is one of the tents at beautiful Ashby Castle. How about that for a campsite? Facilities at our campsites are usually a bit limited (portaloos and ‘glasgow showers’ aka baby wipes) but the sight of the sun setting over some of most gorgeous castles in the world make up for that. 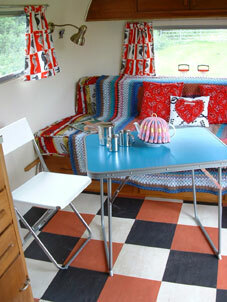 But we do not stint on the other little luxuries in life – in particular a little tipple or two for round the campfire. As I am travelling by train I need to pack light so have found the perfect mini drinks to go. 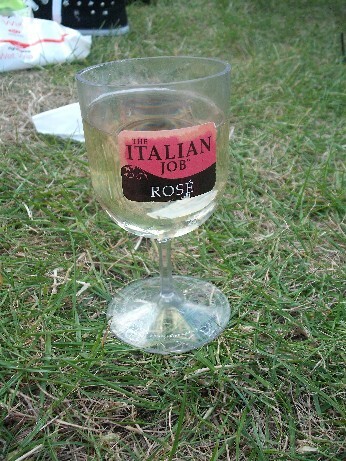 Mini wine with added glass which is actually the lid - unscrews and can be refilled! 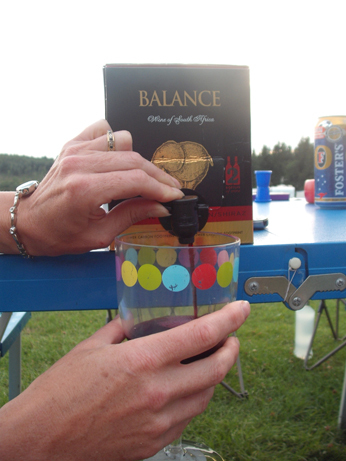 That only holds about two glasses but is perfect for the train and as back up how about the weekend sized wine box – modelled here by me at our campsite in the Forest of Dean last week. 2 bottles worth of lovely red - available from my local Co-op! 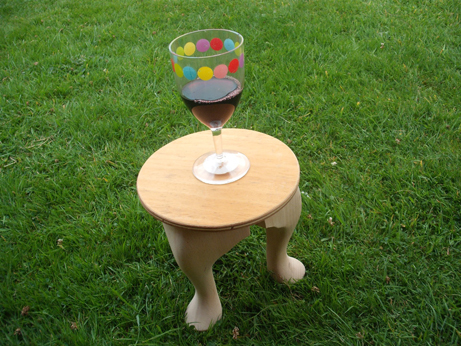 Of course while sitting round the campfire suitable furniture is need to make sure spillage is avoided and my lovely friend Keith has just made all of the girls in the group some little wine tables. He is a builder and gets lots of wood from various sources to burn and turned up in July with boxes and boxes of little legs – some of which we burnt but others got turned into these – we have asked for footstools next! When I met up with my sister in the Forest of Dean she showed me a very dinky little travel case that she had been given as a present so we had a little G and T to christen it. 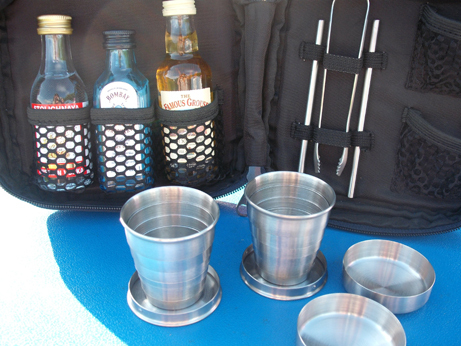 Collapsible cups, miniature bottles, ice tongs and stirrers! I was catching up on blog reading last night and came across a post by the lovely Hen of Hen House about her recent holiday (July 29th 2010 post) in one of the glamping locations I was going to share with you. 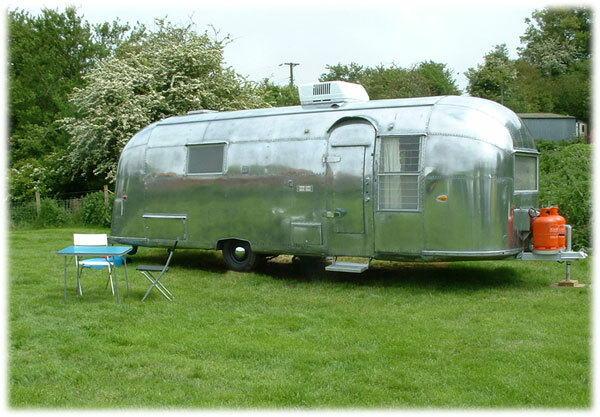 She stayed in an Airstream caravan on the Isle of Wight run by a company called Vintage Vacations. Check out these lovely pics! 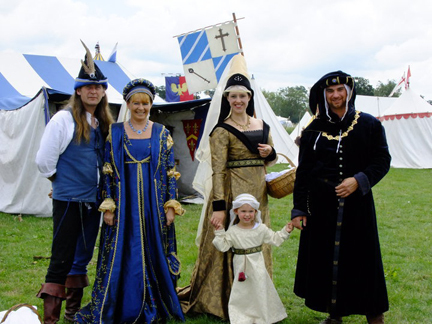 They look fab if you want to re-enact the 1950s rather than the 1350s as we do and are very reasonable prices – I will store that up as a future holiday idea. No more trips for a little while now so I will be spending the time gardening and doing various house sorting activities until our next weekend away. In between the lovely Yorkshire rain of course! Brief dry spell now so am off to do some pruning! Thanks for visiting – see you soon.